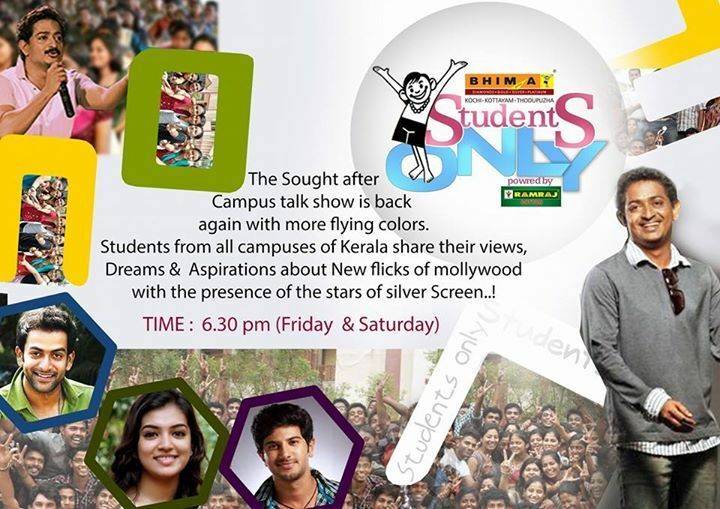 Popular Malayalam campus chat show Students Only Is Back On Kairali TV. Kairali TV is resuming the most popular campus show to its viewers. Govindankutty Adoor is presenting this show. Students from all campuses of Kerala share thier views, Dreams and Aspirations about New flicks of mollywood with the presence of the stars of silver Screen. Bhima Jewelers is the Title sponsor of this show and its Powered by Ramraj. Kairali TV will Air this show on every Friday and Saturday at 6.30 P.M. Govindankutty Adoor is a Television anchor, Director and Actor. He Directed the Movie 3 Char Sau Bees and He acted in the films like Spirit, Nanthuni, Ananthabadram etc.